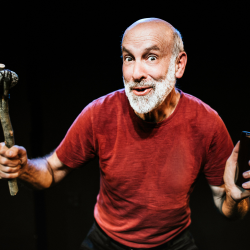 This April, The Marsh San Francisco brings Paul Sussman’s The Wrong Kind of Pessimism to The Marsh Discovery Series, a showcase for works under development. Humans have traded up their caves, tripled their life spans, written Ulysses, and gone to the moon. And along the way, melted the ice caps, oppressed the crap out of each other, and elected you-know-who. Are humans getting anywhere? From the first gentrification (sorry, Neanderthals) to the secrets of the genome, Sussman takes on (and smacks down) the big questions of progress, faith, and where it all ends in The Wrong Kind of Pessimism.